The Florida Project premiered in the Directors' Fortnight section of the 2017 Cannes Film Festival, and was theatrically released in the United States on October 6, 2017, by A24. The film was praised for its direction and acting, particularly the performances of Prince and Dafoe. It was chosen by both the National Board of Review and American Film Institute as one of the top 10 films of the year. Dafoe earned Best Supporting Actor nominations at the Academy Awards, Golden Globes, SAG Awards, and BAFTA Awards. Prince won the Critics' Choice Movie Award for Best Young Performer. Six-year-old Moonee lives with her young mother Halley in the Magic Castle, a motel in Kissimmee, Florida near Walt Disney World. She spends most of her summer days unsupervised with her motel-resident friends Scooty and Dicky, engaging in mischief, mooching from tourists, stealing, and other misbehavior. After the three children are caught spitting on a guest's car, Dicky's father restricts him from playing with Moonee and Scooty. While cleaning up the guest's car they had spat on, Moonee meets Jancey, a child living at the Futureland motel next door, and invites her to hang out with them. Later on, Dicky's family relocates to New Orleans, which saddens the group. Bobby, the manager of Magic Castle, is protective of the children. Halley, struggling to pay rent, hawks perfume to tourists in hotel parking lots and asks Scooty's mother, Ashley, to steal food for them from the diner where she works. However, Ashley cuts contact after discovering Moonee, Scooty, and Jancey set an abandoned condominium on fire. Halley begins offering her services online as a prostitute, closing Moonee in the bathroom when she has a client. When she steals a client's Disney resort passes to sell them, the man returns to demand them back; Bobby sees him off but applies restrictions on unregistered guests in her motel room and warns Halley that he will evict her if the prostitution continues. Desperate, Halley approaches Ashley to apologize and ask for money. When Ashley mocks her for her prostitution, Halley beats her in front of Scooty. The next day, Florida Department of Children and Families (DCF) arrive to investigate Halley. She cleans up the room and gives away her weed, but remains defiant. She takes Moonee to a resort hotel restaurant, where they charge the meal to a guest's room. When they return to the motel, DCF and the police are waiting to take Moonee into foster care pending investigation. Moonee runs away to find Jancey. In the film's final sequence, Moonee and Jancey run away to the Magic Kingdom theme park at Walt Disney World. The Florida Project was shot on 35mm film and entirely on location in Osceola County, Florida. The film's fictional Magic Castle motel was shot at the existing Magic Castle Inn & Suites located on U.S. Highway 192 in Kissimmee, nearly six miles away from the Walt Disney World Resort. Baker filmed the final scene at Walt Disney World's Magic Kingdom Park clandestinely, using an iPhone 6S Plus without Disney's knowledge. To maintain secrecy, the filming at the resort used only the bare minimum crew, including Baker, Bergoch, cinematographer Alexis Zabe, acting coach Samantha Quan, Cotto, Prince, and the girls' guardians. Baker intended the ending to be left up to audience interpretation: "We've been watching Moonee use her imagination and wonderment throughout the entire film to make the best of the situation she's in—she can't go to Disney's Animal Kingdom, so she goes to the 'safari' behind the motel and looks at cows; she goes to the abandoned condos because she can't go to the Haunted Mansion. And in the end, with this inevitable drama, this is me saying to the audience, 'If you want a happy ending, you're gonna have to go to that headspace of a kid because, here, that's the only way to achieve it." The film had its world premiere at the 2017 Cannes Film Festival in the Directors Fortnight section on May 22, 2017. Shortly after, A24 acquired U.S. distribution rights to the film, which began a limited release in the U.S. on October 6, 2017. Lionsgate released the film on Blu-ray, DVD, and download. Willem Dafoe's performance earned him a nomination for the Academy Award for Best Supporting Actor. 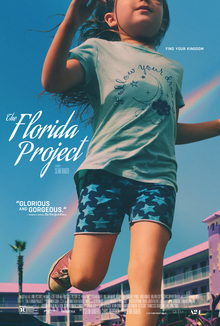 The Florida Project received critical acclaim upon release, with most of the praise going to the direction and the performances of Prince and Dafoe. On review aggregation website Rotten Tomatoes, The Florida Project has an approval rating of 96% based on 260 reviews, with a weighted average of 8.8/10. The website's critical consensus reads, "The Florida Project offers a colorfully empathetic look at an underrepresented part of the population that proves absorbing even as it raises sobering questions about modern America." On Metacritic, the film holds a weighted average score of 92 out of 100, based on 44 critics, indicating "universal acclaim". Ann Hornaday of The Washington Post wrote that "Dafoe delivers his finest performance in recent memory, bringing to levelheaded, unsanctimonious life a character who offers a glimmer of hope and caring within a world markedly short on both." Richard Roeper of the Chicago Sun-Times wrote, "It's film that'll make you wince at times, and you'll most likely not want to see twice, but seeing it once is an experience you'll not soon forget." However, Cassie da Costa of Film Comment criticized the film, writing, "Baker crudely renders his marginalized subjects because while he can imagine their daily realities he cannot fully fathom their inner lives." ^ "THE PROJECT (15)". British Board of Film Classification. October 31, 2017. Retrieved January 27, 2018. ^ O'Falt, Chris (October 6, 2017). "The Florida Project: How Sean Baker Almost Lost His Film Crew - IndieWire". IndieWire. Penske Business Media. Retrieved October 14, 2017. ^ "The Florida Project (2017)". The Numbers. Nash Information Services. Retrieved March 14, 2018. ^ Sanza, Cristina (August 14, 2017). "VIDEO: First trailer for "The Florida Project" film highlights life at budget motel near Walt Disney World". Inside the Magic. JAK Schmidt. Retrieved August 27, 2018. ^ "AFI Awards 2017". American Film Institute. Retrieved December 8, 2017. ^ Gelb, Andy; Purdy, Shawn; Trager, Rachael (November 28, 2017). "National Board of Review Announces 2017 Award Winners". National Board of Review. Retrieved December 7, 2017. ^ Rubin, Rebecca (December 11, 2017). "Golden Globe Nominations: Complete List". Variety. Penske Business Media. Retrieved December 11, 2017. ^ Shanklin, Mary (October 15, 2017). "'Florida Project' film portrays life in Kissimmee hotels". Orlando Sentinel. Retrieved July 27, 2018. ^ Luscombe, Richard (October 15, 2017). "In the shadow of Disney, living life on the margins". The Guardian. Guardian News and Media. Retrieved July 27, 2018. ^ Hakimi, Alexander (October 20, 2017). ""The Florida Project" Director Sean Baker on Working with Untrained Actors and Secret Filming in Disney World". Paper. Retrieved October 22, 2017. ^ a b c Lee, Ashley (October 11, 2017). "'The Florida Project': Director Sean Baker Explains How and Why He Shot That Ending". The Hollywood Reporter. Prometheus Global Media. Retrieved January 12, 2018. ^ "Fortnight 2017: The 49th Directors' Fortnight Selection". Directors Fortnight. Société des Réalisateurs de Films. Archived from the original on April 19, 2017. Retrieved April 20, 2017. ^ Keslassy, Elsa (April 19, 2016). "Cannes: Juliette Binoche-Gerard Depardieu Drama to Kick Off Directors Fortnight". Variety. Penske Business Media. Retrieved April 20, 2017. ^ Seetoodeh, Ramin; Lang, Brent (May 26, 2017). "A24 Buys Sean Baker's 'Florida Project' (EXCLUSIVE)". Variety. Penske Business Media. Retrieved May 26, 2017. ^ D'Alessandro, Anthony (June 12, 2017). "Cannes Directors' Fortnight Title 'The Florida Project' Stakes Out October Date". Deadline Hollywood. Penske Business Media. Retrieved June 12, 2017. ^ "The Florida Project (2017)". Rotten Tomatoes. Fandango Media. Retrieved August 27, 2018. ^ "The Florida Project Reviews". Metacritic. CBS Interactive. Retrieved December 19, 2017. ^ Hornaday, Ann (October 11, 2017). "Review | 'The Florida Project': Willem Dafoe delivers his finest performance in recent memory". The Washington Post. The Washington Post Company. Retrieved November 28, 2017. ^ Roeper, Richard (October 12, 2017). "'The Florida Project' ably explores gloomy lives under sunny skies". Chicago Sun-Times. Retrieved November 28, 2017. ^ da Costa, Cassie. "Review: The Florida Project". Film Comment. Retrieved November 28, 2017.